Live from New York: Recalculating has put together a rad lineup and you’re not gonna want to miss this. The “scrappy, feisty, indie(ish)” post-punk trio, known for hollering clever lyrics over drop-D guitar, is bringing back the edgy, nervous energy they’re known for. 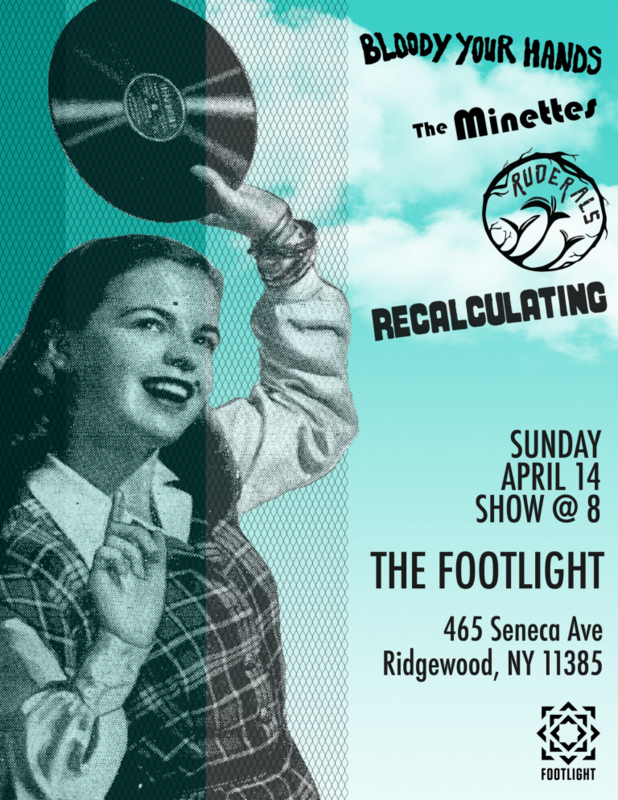 After Marie Kondo-ing their set and leaving only the songs that spark joy, Recalculating is ready to take the stage and share new material at The Footlight in Ridgewood, Queens on Sunday, April 14 at 8 pm. Featuring Bloody Your Hands, The Minettes, and Ruderals, it’s bound to be the can’t miss show of 2019. And – for all the Game of Thrones fans out there who are going, “Eh, I don’t know, it’s the Season 8 premiere” – Recalculating has got you covered; they’re rebroadcasting the episode at midnight, after the show ends, with free popcorn to boot.